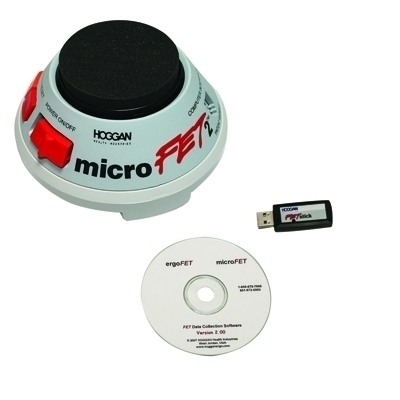 The MicroFET2" Wireless Digital Handheld manual muscle tester (MMT dynamometer) fits in the palm of your hand and weighs less than a pound. LCD located directly on gauge shows peak force and duration. Use as a stand-alone or with clinical software package (sold separately) or FET data collection software package (included). FET data collection software package is designed for research and education applications. The program simultaneously captures raw test data while displaying a real-time graph of the data. The data is saved in comma-separated values (CSV) format and can be opened in most spreadsheet programs for further analysis.